Is a powerful antioxidant that prevents oxidation of Lipids(fats). Fat oxidation has been implicated in the process that leads to atherosclerosis. Fat Soluble and since cell membranes are composed of lipids. It effectively prevents the cells’ protective coating from becoming rancid as a result of free radicals. 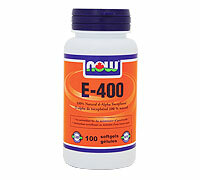 Protects other fat-soluble vitamins from destruction by oxygen and aids in utilization of Vitamin A. Improves oxygen utilization, enhances immune response, prevents cataracts and may reduce risk of coronary artery disease. Natural Form is called d-alpha-tocopherol and is superior to synthetic version dl-alpha-tocopherol. Zinc is needed to maintain normal blood concentrations of Vitamin E.
Selenium enhances vitamin E update and these two nutrients work together in the body. Deficiency may result in damage to red blood cells and destruction of nerves. Signs include infertility in men and women, menstrual problems and neuromuscular impairment. Natural sources include: nuts, soybeans, spinach, sunflower seeds, asparagus and sweet potatoes. 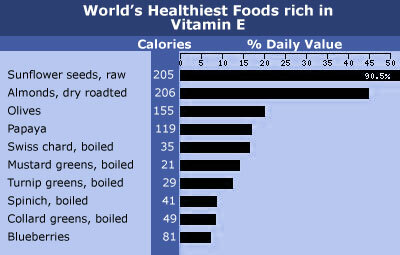 Caution: If you are taking anticoagulant medication (blood thinner) do not take more than 200 IU of Vitamin E daily. If you suffer from diabetes, rheumatic heart disease or overactive thyroid do not take more than recommended daily dose. * There is no gender difference for these recommendations, although breastfeeding women have a slightly higher recommended daily allowance (RDA) at 28.5 IU. ** An adeqate intake, or AI, is used for infants less than 12 months old instead of a recommended daily allowance (RDA).